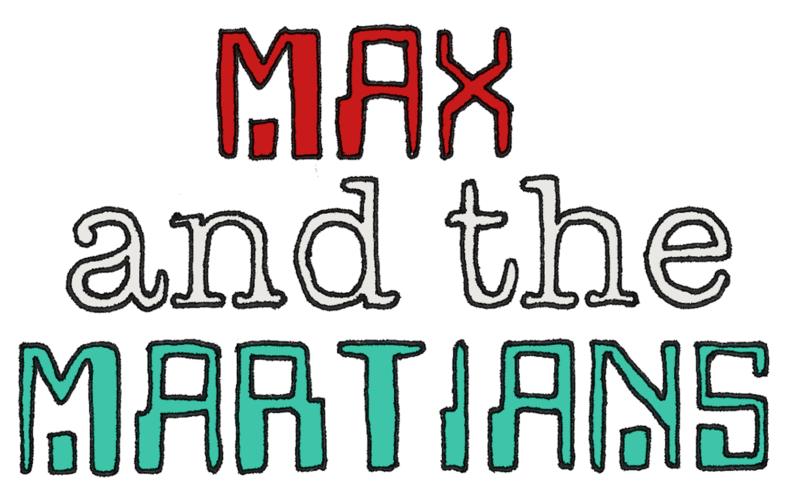 This page contains hints and tips for some of the puzzles you will encounter when you play Max and the Martians. Sometimes examining an object or a person will help give you a clue about what you need to do next. You can examine things in the world, and you can examine the things that Max is holding by pressing on them from the Backpack screen. The people of Oakfield may not all be friendly, but they can be useful. If you're stuck, try talking to them - they may give you some helpful information. Even if you've spoken to someone earlier in the game, it may be worth checking whether they have something new to tell you. Sometimes the solution to a problem involves using two objects together. Try selecting an object (tap on it in the Backback screen - it will appear in the box in the top right to show that it has been selected). Now, when you press on an object or a person in the game, you may find there are some new options available to you. Below are more specific hints about particular problems you might encounter in the game. If you want to avoid spoilers about what happens in the game, don't scroll down too fast! I can't make Max do what I want him to do! To move Max around, simply tap where you want him to go. To go through doors, up stairs, etc., hold your finger down on the door/stairs for a short while and a menu will pop up showing what he can do. How do I see what Max is carrying? Tap on the Backpack button in the top-right of the screen. This will show you the contents of Max's backpack. Sometimes Max will be carrying more than you can see on the screen. Try scrolling up and down to see all of the objects in his backpack. You can 'select' an object from the backpack screen by tapping on it. It will appear in the top-right of the screen to show you that it is selected. The game saves your progress automatically as you move from screen to screen. When you play the next time, simply press 'Continue' to carry on from where you were. If you want to make a more permanent save at a particular point, simply click on the back button (on Android) or the menu button in the bottom left (on iOS) and then select 'Save' from the menu. You can keep up to 3 permanent saves in this way. To load one of these saves, simply select 'Load' from the menu at the start, and pick the save you want to play from. How do I get out of the classroom? Max doesn't really want to leave. Perhaps he should try to persuade Miss Martin to let him stay inside. Talk to Miss Martin. Once you've heard what she has to say, it's obvious that Max will have to leave the classroom, and so he can. What am I supposed to do once I'm out of the classroom? Max wants to find a quiet place to spend his lunch break. See if you can find one. The playground is far too noisy for Max. But have you checked down the far end of it? The janitor's hut is a good place to find some peace and quiet. How do I get past Gregor? Gregor has his own reasons for not letting Max past. Maybe if you spoke to him those reasons would be clearer. Gregor is not going to be happy unless Max gives him something to eat. If you don't have anything to give him, maybe there's something back in the classroom that would help. Try looking in Max's desk - it's the one at the front of the class. I'm outside the school - what do I do now? Try pressing on the bus stop. If you choose 'Wait for a bus' then one will eventually appear. You need to prove to the driver that you're allowed to travel. But you don't have any money for a ticket. Look in Max's backpack (clicking on the top-right of the screen). You can select the bus pass by tapping on it. Then, when the bus arrives, press on the bus and choose 'Show bus pass to driver'. Now you're on the bus! OK, I'm at home. What do I do now? Does anyone know that you're home? Try talking to Grandad. He's on the first floor of your house. I've spoken to Grandad. Now what am I actually supposed to be doing? Max wanted to learn about building rockets, so that's what he should do next. Grandad suggested that he find a book about it. Sounds like a good plan. If you've searched the books in the house, you know there aren't any rocket books there. You'll have to try somewhere else. Oakfield has an excellent library, with a very friendly librarian. You'll have to get on the bus to get to the library. Don't forget your bus pass! Miss Fenchurch can help you check it out. Try using the book with her. You'll need your library card to check out a book. Have you searched everywhere at home? What about the cupboard in Max's bedroom? Have a look inside the treasure chest in the cupboard. You'll need to unlock it first. If you search the house you're bound to find a key. They key to the treasure chest is in the key locker on the ground floor. I have the book, but I can't get Max to read it. Max prefers to study at his desk at home. I need to make some rocket plans. How do I do it? As well as studying, Max likes to do drawing and writing at his desk. He'll need something to draw his plans with. There are pens on the desk. Try picking them up and using them with the desk. OK, that didn't work! He's going to need something to help him draw more neatly. Remember when you got the sandwich from Max's desk at school? There was something else in there too. How do I get back into the classroom? Linda had some keys in her hut. You can't take them while she's there. What would make her leave the hut? Has she mentioned anything that she's had to do already today? The soup in the kitchen cupboard looks a little bit like sick. If you put that soup on the floor in the school corridor, Linda will have to clear it up. I've made my rocket plans. What next? You need to find all the parts you need to build your rocket. Look out for things that look the same shape as the parts on the plan. Maybe you've even got some of them already! I can't find a body for my rocket! There's definitely something at home that you could use. Or on the top floor! Check the ceiling of Max's room. Looks like there's an attic up there. How do I get into the attic? You'll need something to hook onto the hatch. It will need to be long enough to reach, and it'll need a hook on the end to grab the hatch. Look in the garden - you should find something long enough out there. Take the cane from the sunflower. You'll find a hook somewehere in the cupboard in Max's bedroom. Use the pirate hook with the cane to make a hooky cane - now you can grab the hatch. Where can I find a 'Stage 1' section for my rocket? Try using the spaceship plans with the objects around you to see if there is a match. See if you can find something the same shape as the part of the plan. Try looking on the ground floor of Max's house. That washing basket above the washing machine looks promising. How do I get the washing basket down? Try running the washing machine - you'll need something in it before you run it. Check Max's cupboard and you'll find some dirty clothes. In fact, you'll need a big load in to make it wobbly enough to shake off the basket. Maybe Grandad has some extra clothes that need washed. Where can I find a nose cone for my rocket? Look in the greenhouse in the garden. The plant pots look like a pretty good match. Where can I find a comms array for my rocket? What's that on the roof of Max's house? You can probably get to the aerial if you go up to the attic. You'll need to use something long to reach the aerial. Remember the hooky cane you used to get up to the attic? That should do the job. Where can I find boosters for my rocket? You might have to look further afield than Max's house for this one. I wonder if the bus stops anywhere that you haven't been yet? The bus can take you to The Stuff Shop. Maybe you'll find something suitable there. The bottles of fizzy drinks look about the right shape and size. I don't have enough money to buy the kola. Have you spoken to Grandad? Try asking Grandad for some pocket money. Saturday is pocket money day. How can we make Saturday come along? I can't attach the kola to the rocket because it's too heavy. You need to get rid of the kola so you just have the empty bottles. There's a sink on the first floor of the house - try pouring it down there. I have all the parts for the rocket. What do I do now? Try selecting each part and then using them with the box to attach them. How do I go about making the cockpit? Open the box, and examine the inside. You'll need to make some plans - luckily, you have everything you need, and you know all about making plans. Once you have the plans, use them with the inside of the rocket and it will show you where everything has to go. Where can I find a navigation chart for my cockpit? A navigation chart will need to have a picture of all the planets in the solar system. Have you seen anything like that so far? Maybe a trip back to the school would be a good idea. Where can I find buttons for the cockpit control panel? You'll find what you need in somewhere in Max's house. Have you tried looking inside all the cupboards and drawers? Look in the drawer under Moby's bowl on the ground floor. Where can I find a joystick for the cockpit? Remember, you're looking for something with the same shape as the picture on the plan. The lollipop that Linda gave you should do the trick. How do I make the rocket start? You need to use the control panel in the middle. You have to press the buttons in the right order. But what's the right order? Alphatron can tell you what you need to know. I can't take off because I don't have a destination set. OK, I've got to the moon. What now? Have you looked out of the window? Try examining everything you can see - maybe there's something there that would be useful in your travels. Look at the lunar lander. Seems like it has radiation shielding on it that might be useful for a trip to Mars. How do I get the radiation shielding? That's right. No living thing could survive out there. No LIVING thing. Have a word with your faithful companion - perhaps he could help. How do I get outside on Mars? You'll need to design and build a spacesuit. You know how to go about designing things by now - use the Maths Set with Max's desk. Where can I find a body for my spacesuit? What you need is somewhere in Max's house. Have you looked in all the drawers and cupboards? Look in the drawer in Max's bedroom. See anything spacesuit-y? Where can I find a helmet for my spacesuit? Remember, what you're looking for is something that is the same shape as the picture on the plans. Have you searched the ground floor? That goldfish bowl looks pretty much the same shape as a helmet. How do I get the goldfish bowl? You'll need to find an alternative home for Moby before you can use his bowl. Maybe there's something in the house that he could live in for a while. The cooking pot should make a decent temporary home. How do I actually MAKE the spacesuit? Just select the bowl and use it with the onesie - or the other way round. How do I get past the dust storm? If you could just get something attached to the rock on the right, you could pull yourself along. Maybe if you had something like a rope, you could lasso the rock. Have you searched the garden thoroughly? The washing line should do the trick. How do I get past the door on Mars? It looks like there's a security system in place. Have you tried showing yourself to the camera? Maybe it will only let people in who live there. How do I get the baby martian to come out from the rock? It might help if you could understand what he is saying. Shame you don't speak Martian. The martian says she's lost, scared and hungry. Can you do anything about any of those things? Maybe you could help with her hunger. Do you have anything that she could eat? Could you get something for her to eat? Have you been anywhere that had food in it? Try going back to the shop. How about some biscuits. Who doesn't like Classics?